Bramble and Maggie – Give and Take is a wonderful chapter book for second grade level readers that encompasses a good plot, a take away lesson, lovable characters, and rich illustrations. Although the main character next to Bramble the horse is a girl, boys can relate to the overall story and life experiences that are common to the second grade reader. Readers are experiencing what it takes to play and work together. In this chapter book students have a fast moving chapter story that shows how Bramble the horse learns to trust Maggie and how Maggie learns to compromise with her horse. Teachers will appreciate the life lesson in this second grade level reader which can spring board deeper discussions and group activities showing compromise. Parents will appreciate a well written book that helps to reinforce positive character education and family values. 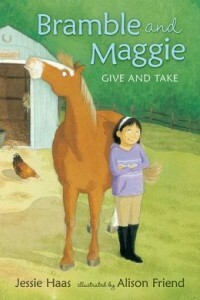 Bramble and Maggie- Give and Take is a reading experience that students will enjoy reading independently. The language is appropriate for the young reader and the concepts are clear and easy to comprehend.